Basic Endgame Theory says to make the biggest play, as a rule. There are exceptions, of course. This page looks at the question of when to violate that rule of thumb with one sente play and one gote play. First, let's look at examples where those are the last two plays left before the dame stage. Here we have a 1 point gote vs. a 1 point sente. What is best play in the corner by each player? White, of course, takes her sente. Black prefers the gote to the reverse sente. The net result is +1. Since the gote and the sente are the same size, the rule of thumb does not provide any guidance. However, because it is close to the conditions for the exceptions, this example gives a clue about how the play will go with exceptions. Note that the key in this example is to get the last play (tedomari). There is a 1.5 point gote vs. a 2 point reverse sente. Black takes the 1.5 point gote and allows White to take his sente. 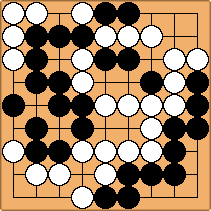 Black has gained 1.5 points for a net result of +1. Black makes the largest play, the 2 point reverse sente, but then White gets the 1.5 gote as tedomari. Black gained 2 points but then lost 1.5 points for a net gain of only 0.5 point. The result is jigo. Here is a case where the proverb, tedomari counts double, applies. 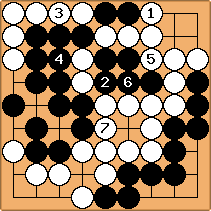 Since the corner gote is tedomari, Black can double 1.5 to get 3 and compare it with the 2 point reverse sente. Then he will know to play the gote. White has a 3 point gote and a 2 point sente. However, she cannot play the sente with sente because its threat is only worth 2.5 points. Black will ignore it. Even though Black will not reply to White's sente, White plays it. is a 2 point sente. However, the value of sente is determined by the value of the reverse sente. actually gains 2.5 points, the size of the threat. Next, gains 3 points. Finally gains 2.5 points. White's net gain is 2 points. Net result: -1. If White takes the largest play she gains 3 points but then loses 2 points when Black takes the reverse sente, for a net gain of only 1 point. Net result: jigo. Again, tedomari is the key to the exception. It turns out that there are some simple comparisons to make without reading the position out that will tell us whether to play the gote or (reverse) sente. First, let's represent the sente and gote as trees. / indicates a play by Black, \ indicates a move by White. Scores are from Black's point of view. Q. 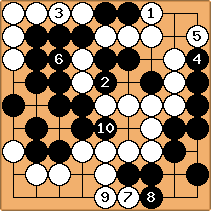 1: Should Black play sente or gote? A. 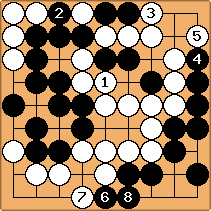 1: Black should play gote if x > z, sente otherwise. Q. 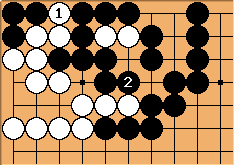 2: Should White play reverse sente or gote? A. 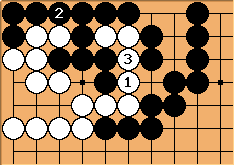 2: White should play reverse sente if y > x, gote otherwise. In Example 1 x = 2, y = 1, z = 4. 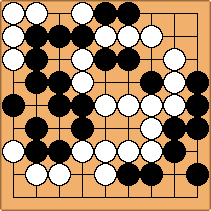 For gote vs. sente, 4 > 2, so play sente. For gote vs. reverse sente, 2 > 1, so play gote. In Example 2 x = 3, y = 2, z = 7. 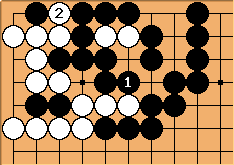 3 > 2, so Black should play the gote rather than the reverse sente. In Example 3 x = 6, y = 2, z = 7. 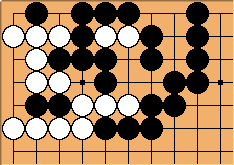 7 > 6, so White should play the sente rather than the reverse sente. Well, you may think, this is fine if there are only two simple plays left. But then we can just read it out. What about the more general case, where these are the two largest plays, but there are other plays on the board, and x, y, and z are not scores, but other hot positions, where somebody will play later? I will address those questions next. This example is perhaps more realistic, since the main plays are more complex, having small followers, and I have added another, small play which is obviously not in contention for . takes the largest play, a 5.5 point gote. Then takes a 3 point reverse sente. Now the temperature has dropped to 1.
and are 1 point plays, and then takes a 0.5 point gote. takes a 3 point sente. Then ignores it and takes the largest play. Next, is a 5 point gote, which is tedomari at that level. Then the temperature drops to 1. - is a 1 point gote, and then is a 0.5 point gote. Here I have added a couple of plays more. After in diagram (i) there are several optimal lines of play, each leading to the same result: jigo. White's winning line is essentially the same as in Example 4. After there are several optimal lines of play, leading to the same result: -1. Why did the addition of two more plays not affect the essential solution? OC, I rigged it that way, but how? In example 4, after the larger plays the temperature dropped to 1. The plays I added to get example 5 were also 1 point plays with no small followers. Those plays could have made a difference, except for the 0.5 point gote in the center. Say that the first player at temperature 1 gets the last 1 point play. Then the second player gets the 0.5 point play. The net result of that play is a 1 - 0.5 = 0.5 point gain for the first player. Suppose, instead, that the second player gets the last 1 point play, and then the first player gets the 0.5 point play. Since the players have shared the 1 point plays, the net result is a 0 + 0.5 = 0.5 point gain for the first player. The first player at temperature 1 always picks up 0.5 point. Miai counting. We use miai counting to compare sente and gote plays. These two plays are the same size.